Happy Wednesday everyone! First, I just want to say thank you for the overwhelming amount of love and support from my last blog post. I can't even begin to explain how much it means to me to have such a positive response. The kindness and words of encouragement mean everything to me. Thank you, from the bottom of my heart. Ok, Mallory. Stop being so sappy. Now let me tell you about this outfit! You guys. I know I've said this before but this really is my favorite outfit right now. Mainly because of these pants. These faux leggings are everything. Super soft and stretchy and beyond comfortable. They're on a weekly rotation. I love pairing them with black to dress them up. 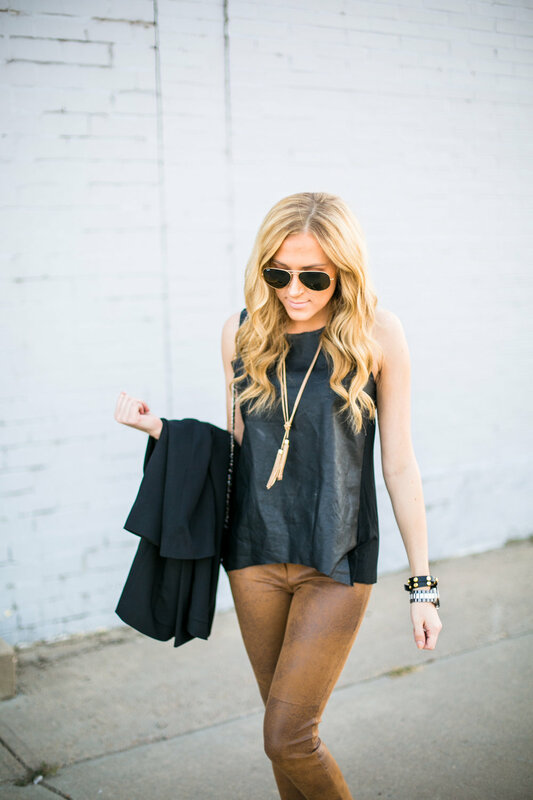 Black and brown is one of my favorite combos so far this fall. I've also been loving this loose fit blazer as a layering piece. Easy to throw on and keeps the look polished. Lastly - these booties were a major score from Target. They're super comfortable and on-trend for the season. Plus they were $35. Doesn't get much better than that, right?